Networks or Friendships in the Netherlands? If you have ‘another’ cultural identity you may assign ‘another’ meaning to friendship and possibly have different, or even conflicting, expectations of your friends compared to those that, for example, Dutch individuals have. Yet, everyone thinks of their own expectations as self-evident. Dealing with the ‘other’ is inevitable whether at work, in your neighbourhood or out on the town. Are your relationships friendships or rather networks? What do you expect from friends? – What relationships function well in the Netherlands? – What has cross-cultural research revealed? Friendship is closely related to how people see their Self in relation to others. The Self-with-Other relationship (especially your close-others and friends ) is one of the most reliable ways to identify important cultural differences (Henrich J., Science, vol, 344, 9-05-2014). At the University of Utrechtf Utrecht we have extensively compared what people from different cultures expect from friends. These findings along with others from cross cultural research, will support the lecture. 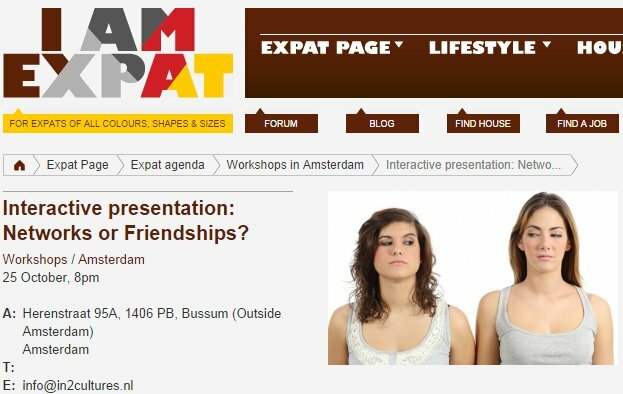 The lecture will also involve stories of real-life interactions between expats and Dutch people. 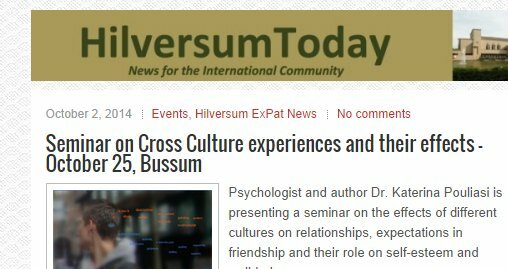 Your reactions in daily life intercultural situations can be tested in an on-line questionnaire.The answers are given anonymously but variation in patterns will be discussed during the lecture. Please first Register. The presentation with discussion lasts from 45 to 60 min. 21.30 – 11.30: getting to know each other. After the lecture a small dish was served for those interested in & at low price prepared with love by Theo Carcassis. We are grateful to all volunteers who took the time and help turning this evening in a wonderful evening! Theo Carcassis and Anne van Lieshout who so efficiently took care of all refreshments and food offered! Goods & More, who offered to all participants a free glass of wine and the opportunity to taste their high quality wines from their collection.